Sports counsil VU is here to represent the interests of all users of the sporting facilities of the VU Amsterdam. Our focus is on improving the user-satisfaction and acccessibility of the VU Sports centre. 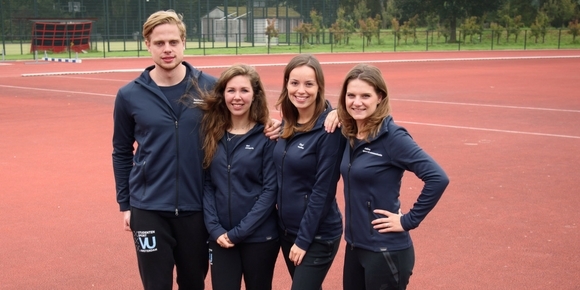 To do so we’re aiming for a higher quality of sports lessons and courses offered by the VU Amsterdam. To improve the accessibility we are working on more brand awareness and transparency of all sports amongst students. SSVU: Where all sportspeople unite. We are your point of contact for questions, remarks and feedback regarding all VU sports facilities. You will find us every Monday from 11.00 tot 15.00 in the VU Sports centre at Uilenstede. Want to know more about us, the latest news about VU student sports or interested in a year in the board of the sports counsil? Get in touch with us!